Pentax K7 vs. Sony A700 and other comparisons. Another comparison is available at artaphot.ch. They compare the A500 vs A700 vs A900 vs Dynax 7D. 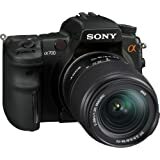 Sony A700 removed from all official european Sony websites. One of our readers noticed that no european Sony website is showing the Sony A700 .